Janis works for the East Brunswick and Milltown Recreation Dept. Janis has a good time as a free spirit in the community creating randomly and looking for places to work her kids projects into unusual, fun places. 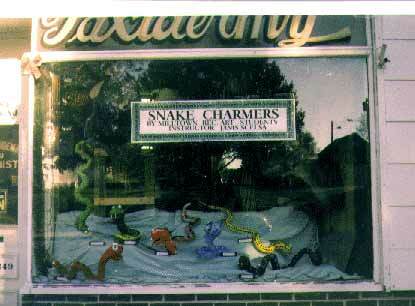 The snake project began at Schwendeman's Taxidermy, on Main Street, Milltown. In and among the rocks set up for the other stuffed animals, the snakes slither up down and sideways. These same snakes slid into the Visual Arts League show at Lincoln Center this winter-"Teens Speak Thru their Art". The snakes then moved on to converge with three shows in one... "UMD-500" at the University of Medicine and Dentistry, Piscataway, N.J. Now, as a parting gesture, they are up here in cyberspace. Keep an eye on them, we will make them wriggle and hiss!